Fall is finally here!!! Actually its been a more than a month that it has arrived. As usual I am having late realizations. Be it in US or India, this is my favorite time of the year. I love the beautiful colors of the Fall here and back home its Durga Puja time. Durga Puja is the most important festival for Bengalis and the frenzy associated with it uncomparable. Even here, the Bengali Associations organizes the Durga Puja every year, albeit in a much smaller scale. I am excited to be a part of such an occasion this weekend!!! 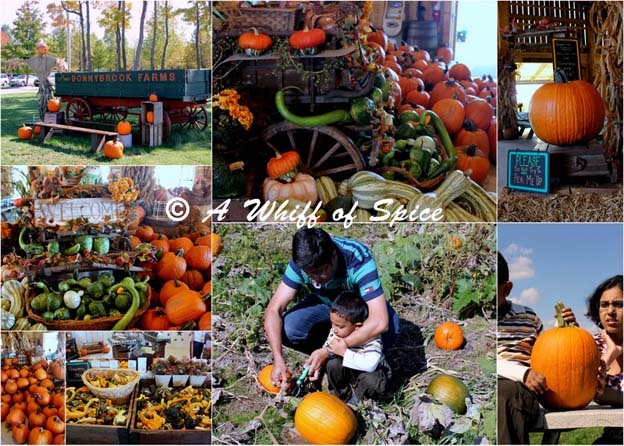 Keeping Durga Puja aside, this Fall Lil Sid had his first Pumpkin Patch visit and was thrilled to bits. He tried to lift every pumpkin he came across and gave up saying, "Too Heavy!" Finally he and his Dad picked up a moderately sized pumpkin from the fields and Sid became so fond of his new prized possession that he even wanted to sleep with his pumpkin! Sid wanted to carve a Jack-o-lantern out of his "beautiful" pumpkin as Caillou and his Grandpa had done but alas! His Mommy is not half as talented as Caillou's Grandpa! "Next year maybe" was her valiant try to pacify wailing Sid. Sam was worried that the pumpkin would rot sitting eternally on our kitchen counter table and Sid did not want any knives near his "its my pumpkin". Finally Sam could convince him that Mommy would make yummy goodies out of the pumpkin for him and he gave in at the mention of Pumpkin Pancakes. The Pumpkin festival continued at my home for two full weeks starting with Pumpkin Pancakes for Sid. I boiled and then pureed the pumpkin and added to my usual Pancake batter and served it with Maple Syrup. Next we had Kumror Chokka, a dry pumpkin side dish with Kala Chana (whole Bengal gram). My friend Kichu Khon's recipe of Kumror Chokka is very similar to the way I cook it. I use Paanch Phoron (Bengali five spice - mix of Cumin, Nigella Seeds, Fenugreek Seeds, Mustard Seeds and Fennel Seeds) instead of just cumin for my tempering. Rest all remains the same. I also made Kumro Bhaja (Pumpkin Fritters) by dipping thin slices of pumpkin in a thick batter made of flour , corn flour, oil and water and a sprinkling of Poppy Seeds and then deep frying it. It was delightfully sinful and not so healthy. Not to forget the Kumro Bhaat e (Mashed Pumpkin with mustard oil, red onions and fiery green chilies), which brought back nostalgic childhood memories for Sam and me. The Pumpkin soup was the grand finale of our Pumpkin Fest. I really wanted to give it an Indian flavor and hence added a lot cumin. The cumin also imparted a smoky flavor to the soup which was further enhanced by Smoked Sweet Paprika. Those who know me or follow my blog knows my love for garlic. But in this soup, I ditched it completely and went for ginger. Cumin-ginger is a classic combination and the ginger also provides warmth to the soup. A very hearty and filling soup and Sid approved too! Peel and chop the pumpkin into big chunks and roast them in an 450 F oven for 35-45 min, till the pumpkin is tender. Let it cool and then mash it and keep aside. In a soup pot, heat oil and add cumin seeds. Let it splutter for sometime. When the spluttering stops, add chopped onions and grated ginger and fry till the onions are slightly brown. Approx 3-4 min. Next add the cumin powder and paprika. Mix well and cook for another minute. Now mash the roasted pumpkin and add to the pot, mixing it well with the rest of the masala. Add half a cup of milk and make a fine puree of the pumpkin mixture. You could do it in a blender or a food processor or even use an immersion blender. I used a hand held one and it worked beautifully. There was a little spluttering here and there, the puree was fine. Return the pumpkin puree to heat and add the remaining milk and bring it to a boil. Check for salt and pepper and adjust accordingly. Ideally would have served it some toasted pumpkin seeds, but didn't have them on hand. So I served with toasted sunflower seed and jalapeno Greek Yogurt. I got this idea from Soma of eCurry's recipe. She had used fresh chopped Jalapeno and mixed it with sour cream. I chopped up some pickled Jalapenos and mixed it with Greek Yogurt. The combination was heavenly. This Jalapeno Cream is a must with this smoky Pumpkin soup. 1. Peel and chop the pumpkin into big chunks and roast them in an 450 F oven for 35-45 min, till the pumpkin is tender. Let it cool and then mash it and keep aside. 2. In a soup pot, heat oil and add cumin seeds. Let it splutter for sometime. When the spluttering stops, add chopped onions and grated ginger and fry till the onions are slightly brown. Approx 3-4 min. 3. Next add the cumin powder and paprika. Mix well and cook for another minute. 4. Now add the mashed pumpkin to the pot, mixing it well with the rest of the masala. 5. Add half a cup of milk and make a fine puree of the pumpkin mixture. 6. Return the pumpkin puree to heat and add the remaining milk and bring it to a boil. Check for salt and pepper and adjust accordingly. 7. Serve hot with a dollop of Jalapeno Cream. To make the jalapeno cream, 2 tsp of finely chopped pickled Jalapenos with half cup of Greek Yogurt or Sour Cream. You can always adjust the heat factor. If you want it mild, use one or even half a tsp of chopped jalapenos. This soup is now synonymous with Fall for my family. And please... please pretty please do not forget the Jalapeno cream. It makes a lot of difference. Thanks Soma for that wonderful tip. The Pumpkin Soup returns to my kitchen next Fall. Pee gee I so love Pumpkin soup but the hubby doesn't as it is not spicy will treat him to your version I am sure he will like it . Oh! I am sure he will like it... Dont for get the Jalapeno cream... its give such a wonderful kick to the soup!